Fairy lights are tiny yet surprisingly bright, beautiful, incredibly easy to work with, and can go almost anywhere...with so many endearing qualities combined, we suspect they might have a little magic in them! Pour a glass of eggnog and explore the charming world of fairy lights with us. We have a feeling once you see the amazing selection and decorating ideas we've gathered, you'll be ready to put a spell on your own holiday decorations and DIY craft projects with our enchanting inspirations! 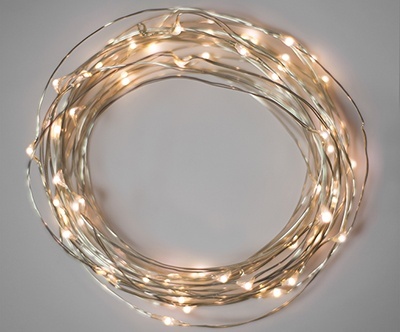 Fairy lights are tiny LED bulbs on a thin, flexible metal wire. They are available in a full spectrum of fun colors and the ability to bend makes fairy lights perfect for use with craft projects and indoor decorating. Most fairy lights are battery operated with timer functions, however some have plug in adaptors as well which makes them able to adapt to a large variety of locations and decorating situations. In addition to traditional fairy light strings, there are several specialty fairy light styles available. Fairy Lights with Decorative Accents - some fairy lights have unique adornments on the string to create a fun, decorative addition to your light displays. 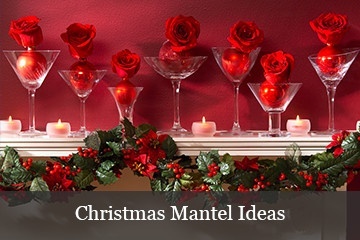 Examples include fairy lights with crystal gems, metal beads and even small globes covering the bulbs. Garland Fairy Light Clusters - dozens of small LED lights shoot off of these clusters, making them a beautiful addition to centerpieces and greenery displays. 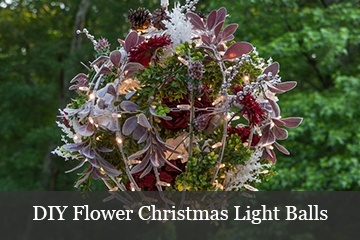 Garland fairy light clusters can be bent and shaped to work with a variety of decorations. Mesh Rope Fairy Lights- with so many bright color options, mesh rope lights are a fun choice for wrapping around decorative items like wreaths and garland or outlining windows and frames. You could even attach them to a Christmas sweater to create a fun light up design! Ribbon Fairy Lights - The name says it all! These fairy lights are inside of a flexible ribbon - perfect for wrapping presents or adding a pop of color to wreaths, garlands and Christmas mantel decorations. Fairy Light Sprays - This beautiful cascading light decoration combines multiple strands of LED fairy lights together. Fairy light sprays can be plugged in and include a controller which allows you to choose from 8 different functions. 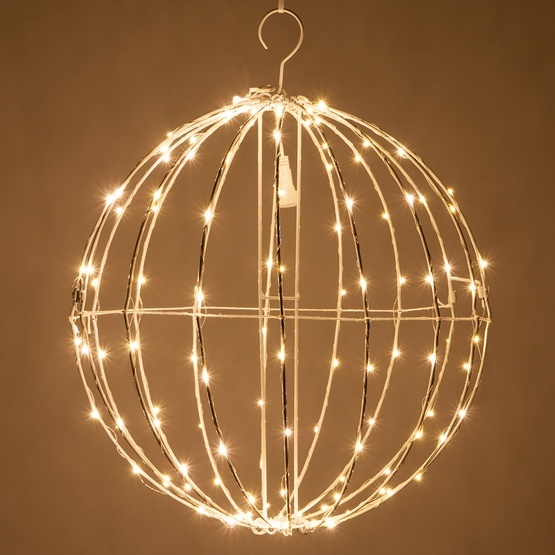 Fairy Light Balls - are metal frame spheres wrapped with LED fairy lights! These are beautiful hanging decorations - perfect for use in trees, across the porch and as ambient indoor lighting. Fairy Light Sprays - This beautiful cascading light decoration combines multiple strands of LED fairy lights together. Fairy light sprays can be plugged in and include a controller which allows you to choose from 8 different functions. Fairy light sprays can be plugged in and include a controller which allows you to choose from 8 different functions. The thin flexible wires of fairy lights let them hide inconspicuously around existing decorative items or stashed inside tight spaces and allow for a multitude of design possibilities. 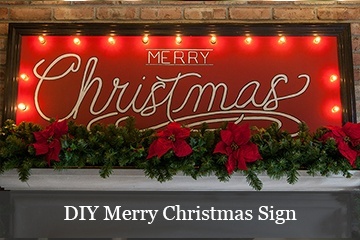 We've highlighted a few of our favorite fairy light Christmas decorating ideas below. 1. Decorative Jar or Container Fairy Lights- Place LED fairy lights in a decorative jar or vase to create a lighted centerpiece or Christmas mantel decoration. Add faux snow, ornaments or other decorative adornments as filler - not only will they look gorgeous, but they'll hide the battery pack too! This idea also works well for other holidays. Fill a vase with decorative flags and red, white and blue ornaments for a patriotic themed fairy light display or green fairy lights, spiders and purple, orange and green ornaments for a spooky Halloween centerpiece! 2. Illuminated Wreaths and Garland - This idea is so easy! Just wrap fairy lights around a holiday wreath or garland to add a bright glow that can be turned off with a flip of the battery pack switch! Ribbon, garland cluster and mesh rope fairy lights are especially beautiful wrapped around greenery. 3. Lighted Christmas Shadowbox or Snow Globe - Make a winter wonderland themed scene contained inside a shadowbox or create a Christmas snow globe using bottle brush trees, Christmas village pieces, faux snow and battery operated LED fairy lights. Hide the fairy lights underneath faux snow or poly-fil to create the look of a glowing wonderland. Then place tiny trees, a snowman, Santa and his reindeer or other figurines on top to create a charming Christmas village scene! 4. Glowing Holiday Chandelier - Wrap fairy lights around a wire wreath frame and secure the battery pack to the frame using electrical tape or zip ties, then wrap the frame loosely in a sheer fabric leaving some space to add decorations. From here hang icicles, snowflakes, ribbons and ornaments from the frame, then tie a couple of ribbons of the same length on each side to create a way to hang it. Now just turn on your fairy lights and enjoy! 5. 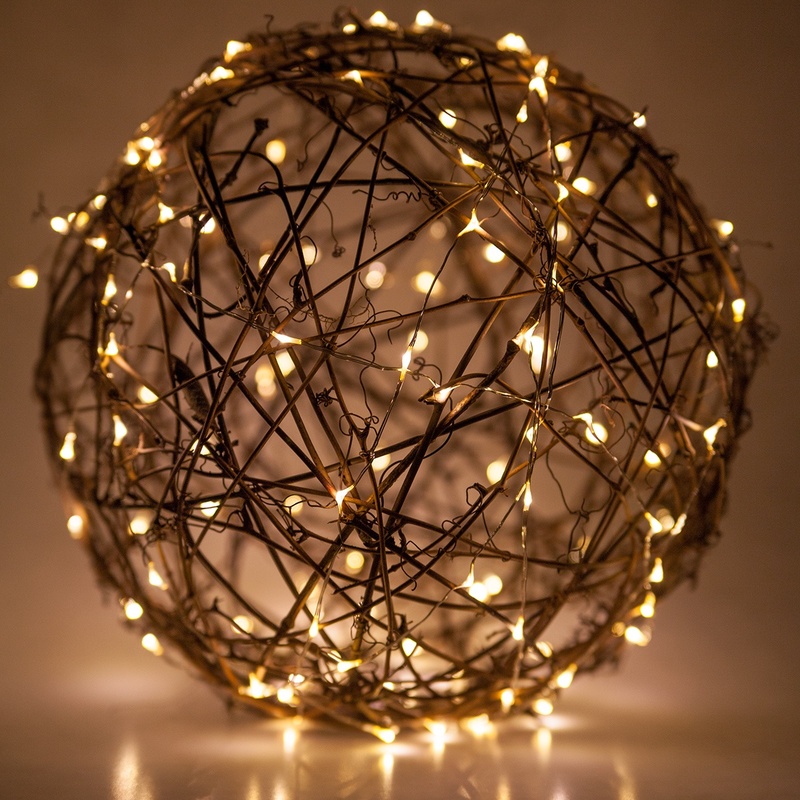 Fairy Christmas Light Balls - Create Christmas light balls by wrapping a grapevine sphere in fairy lights. Then hang your light balls from tree branches or place them in planters on each side of your front door as lighted topiaries. If DIY isn't your style, you can purchase pre made metal frame fairy light balls in a variety of colors! Love Our Holiday Decorating Ideas? Now, back to the magic of Fairy Lights.. In addition to the holiday decorating ideas above, there are a variety of ways to use fairy lights to illuminate a wedding ceremony and reception! The battery pack is convenient for easily lighting areas without the need for plugs and the thin wires hide perfectly against florals, linens and sheer fabrics. LED fairy lights can be hidden inside of lanterns, mason jars, colorful glass vases and more to create table centerpieces or lighted aisle markers. Illuminate a cake table or guest book signing table by placing fairy lights underneath sheer linens or laying them on top of the table. If placing fairy lights on top of a table, the key is to make them look like part of the decor by creating natural curves with the flexible wire. Fairy lights can also be woven through bouquets and flower arrangements or used to outline wedding frames and signs. Are you a bride to be? Visit our wedding lights guide for more decorating ideas to illuminate your big day! Proper storage is essential to increasing the life of your fairy light strings. The thin light wire can become easily tangled with other objects or around itself if thrown into a box with other decorations. To prevent tangles and ensure your fairy lights are ready to use straight out of storage, find a cylindrical object to wrap them around. An aluminum snack can works great for this. Place the fairy lights battery pack inside the clean can and then wrap the lights tightly around the outside and secure the end with a small piece of electrical or residue free tape. You can also wind fairy lights around a few of your fingers to create a circle and then place the battery pack and wound up lights inside of a can or plastic bag, just make sure the light ends are secured so they don't unwind in storage!